We love creating geeky recipes! Obiviously right? Well, we also love seeing other people’s geeky creations. Especially in cookbooks! When we heard about Insight Editions’ The Walking Dead: The Official Cookbook and Survival Guide, we were beyond excited. Throughout the course of the show there have been a ton of food references. We were excited to see what they put together, especially since the recipes appeared to be less about decoration and more about substance. As fans of The Walking Dead, especially the early seasons, this cookbook is a fantastic trip through the history of the show. The recipes are pretty straight foward and easy to follow. They also don’t use a ton of hard to find ingredients which is nice. We also love the fact that while they feature recipes for fan favorites like Carol’s Cookies, they also have other recipes inspired by characters. An example of this is the recipe for Rick’s Cucumber and Onion Salad which we have shared below. Another great feature of this cookbook is the survival guide section. While it isn’t the Army Survival Handbook, it does teach you some great hunting, fishing, and foraging skills. Tips for food preserving are also included. 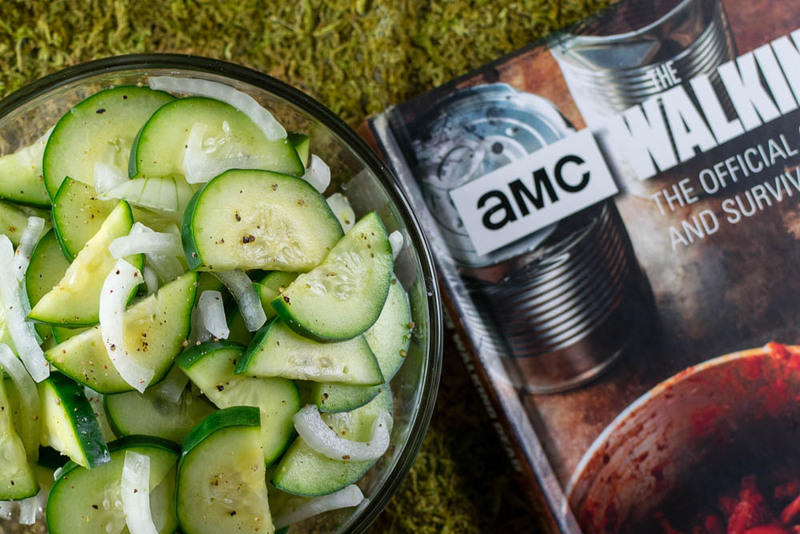 We hope you’ve enjoyed our review of The Walking Dead: The Official Cookbook and Survival Guide! We have several other cookbook reviews in the works! Up next is the Pokemon Cookbook! Is there a cookbook you’d like us to review? Leave a comment below and let us know! Put sliced cucumbers and onions into a large mixing bowl. Sprinkle liberally with salt to taste, toss, and set aside. Combine the vinegar, water, sugar, and celery see in a small saucepan. Heat over medium heat until steaming, but do not boil. Pour the dressing over the cucumbers, and let them sit for at least an hour before serving, or cover and let them sit overnight in the fridge. Toss and season with pepper to taste before serving. 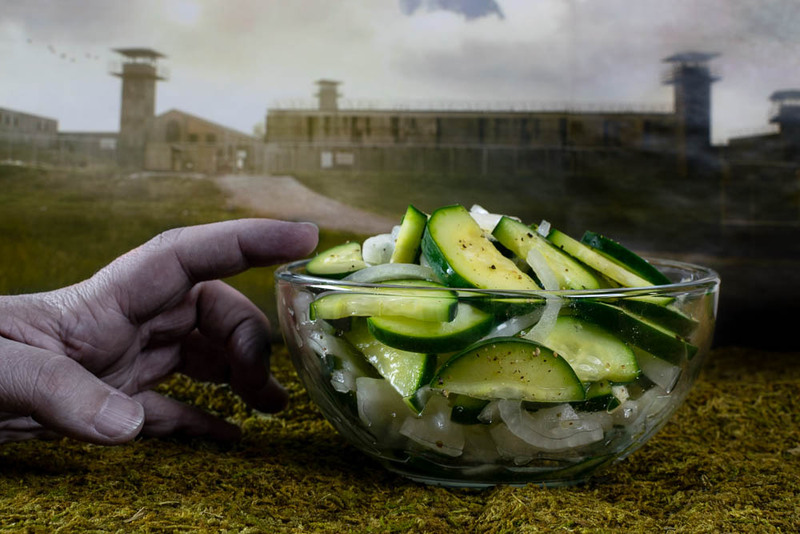 This simple cucumber salad uses a very traditional Southern preparation, perfect to serve alongside other recipes from the Walking Dead Cookbook. *The Geeks were not compensated or given any comped items to facilitate this write-up and interview; Recipe shared with permission from Insight Editions. All opinions are wholly our own. View our Disclosure Policy for more info. What about the Onion? It is in the list of ingredients but not in the directions. those who may not know? Not into the Walking Dead stuff – but love this recipe.